Derry City are pleased to announce that the club will be making the change to Adidas playing kit and leisurewear for the next three years. The global kit leader’s famous three striped kit is worn by the likes of Manchester United, Real Madrid and Bayern Munich, and from the 2018 campaign Derry City will be joining the German sportswear giant’s esteemed stable of clubs. The club have partnered with House of Sport, one of the largest adidas suppliers in the UK and Ireland. Adidas will provide a range of kit and leisurewear to the club from the 2018 League of Ireland season onwards. Design work for the new kits and leisurewear is already underway with the club expecting to launch an extensive range of leisure and playing wear ahead of the Christmas period. 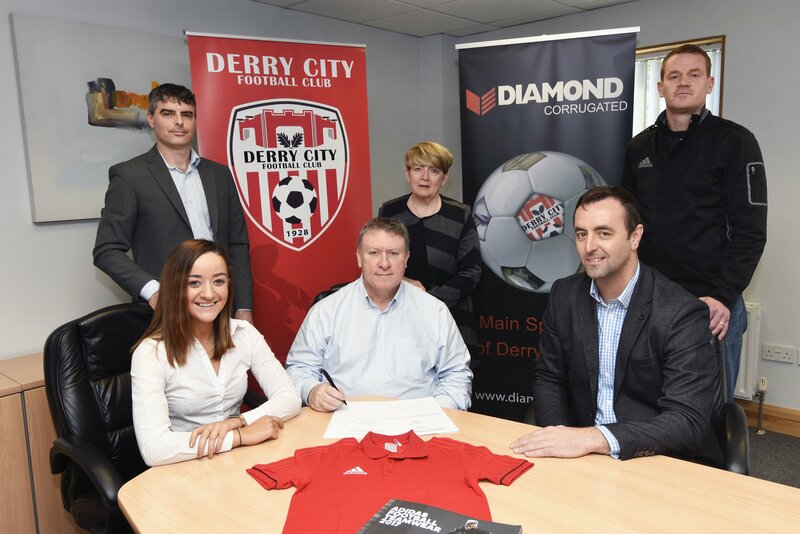 Pictured at the signing of Derry City’s new Adidas kit deal in association with House of Sport are back row left to right Declan Callaghan (Derry City Merchandise Group); Dodie McGuiness (Derry City General Manager) and Steven Burns (House of Sport Team Sales Manager). Front row Orlaith Meenan (Derry City Commercial Manager); Philip O’Doherty (Derry City Chairman) and Padraic McKeever (House of Sport Managing Director). The new arrangement will also bring a huge boost to Derry City’s online activities, with club supporters around the world able to access a full range of club replica and leisurewear in a new online shop, using House of Sport’s extensive e-commerce facilities.